Hungry for a seriously nutritious strawberry dish? 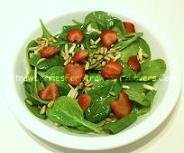 Try this spinach strawberry salad recipe! This spinach and strawberry salad is absolutely amazing! You won't believe your mouth! Begin by adding the salt to the pine nuts and shaking them together in a container. Next, remove the pine nuts from the container and discard any salt that doesn't stick. Now, toss the spinach together with the olive oil and malt vinegar, and then place the tossed spinach into the serving bowl. Finally, sprinkle your salad with the pine nuts, almonds, and sliced strawberries. All that's left is to enjoy this dish like you've never enjoyed a salad before! If you want to add a little meat to your salad, you might even want to try a spinach salad with strawberries... AND grilled chicken! Just adding 6-8 nice slices of grilled chicken is all it takes! The meaty, grilled flavor of this grilled chicken, strawberry spinach salad recipe might just remind you from-time-to-time of the absolute best tasting grilled burger you can imagine... try it, and see if the magic happens for you, too! Either way, you'll love the taste, and you'll be eating a very nutritious dish! Please eat this in good health, and remember that you found the recipe here at StrawberriesForStrawberryLovers.Com, Home of the World's Happiest Fruit!